Jack Stand | Piping Technology & Products, Inc. 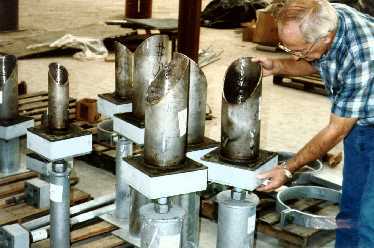 The photograph above shows unique jack stands designed to support stainless steel pipe. The top, which connects to the pipe at elbows, is fabricated from stainless steel. The bottom, which can be used to adjust the height, is fabricated from carbon steel and the galvanized. The two dissimilar materials are separated by a polyurethane[pdf] isolation block which is painted for protection. Want to learn more about the other types of products we have? Visit our webinar archives today!